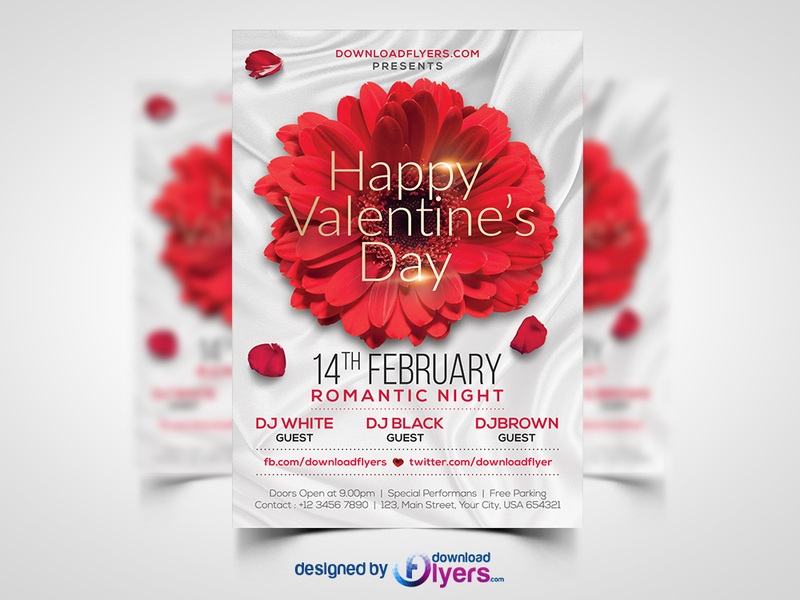 Download Valentines Day Flyer Template Free PSD. This is a Free PSD Photoshop Flyer Template for your upcoming Romantic Valentine’s Day party event. Valentines Day Flyer Template Free PSD works perfect to use for any Valentine Event, Party, Mixtape Covers or any other Business proposes as well. This Valentines day flyer template is simple text focussed layout enables you to produce a rockstar Valentine’s Day design in just minutes, even without Advance Photoshop experience. This Valentines Day Flyer Template Free PSD File is very easy to edit, change the color, text, shapes or other elements that you can easy add/delete according to your personal choice. The header of the design is filled by a large with large red flower. This flower replaces the need for stock images yet giving elegant look to this Valentines day flyer template. Valentines day flyer template psd is without model, but in case you want to add any model picture, you can replace with your own image. Whether you’re looking to produce a Valentine’s Day flyer for a nightclub, or an invitation for a restaurant, we’re sure this flexible and easy-to-use template is a prefect choice of flyer design. All elements shown are included in the PSD. The PSD file is setup at A4 Size, CMYK, 300DPI and Very Well Organized. Valentines Day Flyer Template Free PSD is perfect for party promoters, bar owners or friends and family parties, this editable photoshop template is the great solution for advertising your Valentines Day party event, nightclub and venue. You are also granted an Unlimited Use and 100% Royalty Free License meaning you can use this free valentines day flyer template psd as many times as you wish for as many clients as you wish. You are free to use this valentines day flyer template free psd in both personal and commercial work. If you use this awesome free flyer template kindly give some credit to DownloadFlyers.com as well. So Download this print-ready and well-organized Valentines Day Flyer Template Free PSD file and use it as you like. Hope you like it. Enjoy!